The foundation of any ethical jewelry sourcing of precious metal is simple: the people of the land must be able to control and fully benefit from the resources of the land. Indigenous land rights are the source point of truly ethical metal used in jewelry. Here, I use the term ‘indigenous’ in a broader sense—people who inhabit and depend upon a land where they have lived for generations, existing in real relationship to a landscape with all its history, mythology and ancestors. On that foundation, if metal is to be ethically sourced for jewelry, we must consider fair labor, sound environmental practices, and a traceable, transparent, and independently-audited supply chain from the mine all the way to the customer. Fairtrade Gold is the only gold which meets this criteria. Broadly speaking, gold mining operations can come from either large-scale or small-scale artisanal mines. The first large-scale gold mines were in California in the mid-nineteenth century. The legacy of these mines are a living memory of genocide among Native people. It is also estimated that 19 million pounds of mercury from over 55,000 abandoned mines have contaminated California’s watersheds. Unfortunately, the nefarious impact of large-scale mines has not changed much over the last 150 years: what was pioneered in California was exported to the rest of the world. Large-scale mining today is still characterized by intensive investment and highly mechanized efficient extractive methods that wreak havoc on communities and the environment. A large-scale gold mine might move hundreds of thousands of tons of dirt daily. Exploitation and disenfranchisement of indigenous people go hand in hand with these neo-colonial entities that often collude with corrupt governments. Once the gold is extracted, profits are exported to shareholders around the world. 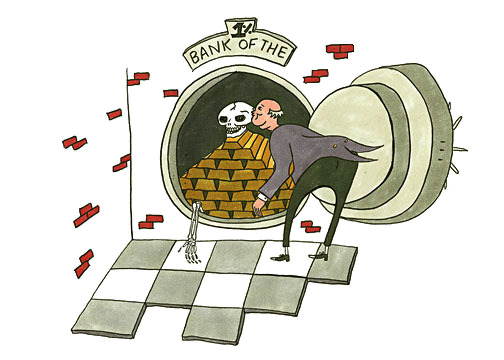 Because there is already more than enough gold to serve our industrial needs, the gold often ends up in bank vaults. Large-scale gold mining is one of the most destructive industrial activities on earth. Initially, large scale mining companies come into communities with offers of jobs and economic wages. It is extremely rare that job expectations are met. Once the mine runs its course, the community ends up even more impoverished because they no longer have a viable land base which once supported their wellbeing. Land which was once a blessing becomes a resource curse. From an ethical perspective, large-scale gold mining should be banned and consumers should boycott jewelry made with it. Small-scale mines are typically owned and managed by local people who’ve discovered and then dig for gold. 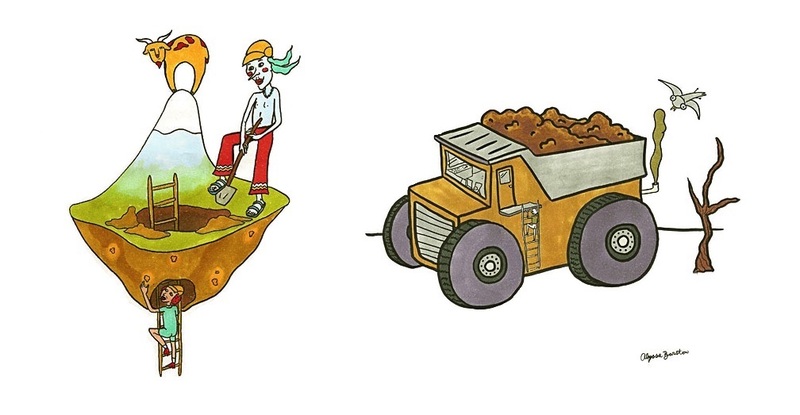 Small-scale mining is human scale, slow, and highly localized. The average woman or man with a shovel might move a ton of earth a day. While a large scale gold mine might produce over a hundred kilos of gold a day, a small mining community of forty to sixty people might produce a half kilo to a kilo of gold per month. A kilo of gold these days is worth about $42,000. The gold is often sold to traders, in small amounts, and it is not uncommon for the miners’ gold to be discounted 25% or more. If you add up the costs of equipment, diesel for generators, and other necessities, miners might end up making $200 a month, which is often hardly enough to pay for enough food, clothing and shelter to sustain a family— much less provide any hope of a better future for miner’s children. Small-scale mining is typically illegal, highly destructive to the environment, and characterized by poverty, child labor, and exploitation. However, as a development initiative, small-scale gold mining has tremendous upside potential which is realized with the help of Fairtrade International. Small-scale miners who are certified to produce Fairtrade Gold are introduced to the best practices. They agree to adhere to a published standards and principals. The environment is protected from mercury spills. Miners are able to utilize resources over a long period of time, which can build a stronger local economy. In essence, Fairtrade Gold applies the principles of slow money to local mining and development. Small-scale mining communities are supported in their efforts to make a viable living through the resources that are on their land. Small-scale mining, with the support of a vibrant Fairtrade Gold market, could have a transformational impact over time on millions of small-scale miners, therefore empowering indigenous communities. The obstacle that prevents this from happening is large-scale mining interests seek to keep the jewelry buying public ignorant of their practices. *Continue on to the next step in Fairtrade Gold vs Dirty Gold sourcing: The Environment.